“A coalition of alcohol experts including doctors and researchers have accused federal, state and territory governments of failing to properly acknowledge the role of alcohol in family violence. Among the 21 signatories are family violence experts, emergency department doctors and alcohol researchers and the Chief Executive Officer of the Central Australian Aboriginal Congress Aboriginal Corporation and former NACCHO CEO Donna Ah Chee. ” But it is clear that the overwhelming majority of people who experience such violence are women. “The most prevalent effect is on mental health, including post-traumatic stress disorder, depression, anxiety, suicidal ideation, and substance abuse. “There are also serious physical health effects including injury, somatic disorders, chronic disorders and chronic pain, gastro-intestinal disorders, gynaecological problems, and increased risk of sexually transmitted infections. As a community, we must stamp out violence against Australian women, and bring an end to all forms of family and domestic violence, whoever the victim. “These policy interventions have the full support by frontline services and health professionals who have long been advocating for preventive action. “We fear that the forum today and the future discussions will continue to ignore alcohol’s role in family violence and fail to embrace strategies to address the issue,” the statement said. Today our leaders will meet in Brisbane for the Council of Australian Governments (COAG) National Summit on reducing violence against women and their children. The continued national focus on the need to address family violence should be congratulated. However, to date we are still failing to acknowledge and address many of the factors that contribute to family violence. We fear that the forum today and the future discussions will continue to ignore alcohol’s role in family violence and fail to embrace strategies to address the issue. We know from our research that the role of alcohol in family violence cannot be ignored. Alcohol contributes to between 23 to 65 per cent of domestic incidents reported to police and between 15 to 47 per cent of child abuse cases reported in Australia.1 More than a third of intimate partner homicides involve alcohol consumption by the perpetrator.2 The impact of alcohol on children is also significant, prenatal exposure to alcohol may result in Fetal Alcohol Spectrum Disorders (FASD), which are associated with increased risk of maltreatment and other problems including violence later in life. We also know individuals living with FASD are more likely to be either victims or perpetrators of violence. Until governments give more than thoughtful consideration to the factors that contribute to family violence, such as alcohol, the family violence discourse remains incomplete. This is to the detriment of families and communities across Australia. Consistent with recommendations from the World Health Organization,5 we urge First Ministers, Families’ Ministers, and the experts at the National Summit to expand the scope of consideration to include further evidence-based interventions that directly target the contributing factors of family violence. The evidence shows such interventions can bring about rapid and sustained reductions in the incidence of family violence. Many interventions designed to reduce alcohol harm across Australia can be enacted swiftly and at low cost, resulting in immediate reductions in family violence. These solutions begin with reforming the taxation system to discourage the sale of cheap alcohol, reducing the physical availability of alcohol, and removing the sexualisation of women from alcohol advertisements. Addressing these factors will demonstrate real leadership and improve the safety of women and children across Australia. AMA President, Dr Michael Gannon, said today that doctors have a unique and trusted role to play in the early detection, intervention, and treatment of patients who have experienced family and domestic violence. Releasing the AMA’s revised and updated Position Statement on Family and Domestic Violence 2016, Dr Gannon said the AMA is committed to providing important information and guidance to empower doctors, especially GPs, to provide better support for victims. Ahead of the COAG National Summit on Reducing Violence against Women and their Children, which commences in Brisbane today, the AMA is calling on all Australian governments to properly fund and resource, on an ongoing basis, specialised family and domestic violence support services, including housing and crisis accommodation. Dr Gannon said it is disturbing and unacceptable that, in a modern and sophisticated nation like Australia, a large number of women experience some form of physical or sexual violence in their lifetimes. “Two women are killed nearly every week in Australia due to family and domestic violence,” Dr Gannon said. “The health effects of family and domestic violence in both the immediate victims and their families are devastating, and it is not only women who are the victims. “Family violence affects people of all genders, sexualities, ages, socio-economic backgrounds, and cultures. “And we are now also seeing increasing instances of elder abuse, with grandmothers and grandfathers, many frail and vulnerable, being subjected to violence from family members. “Men can be victims. Women can be perpetrators. But it is clear that the overwhelming majority of people who experience such violence are women. “As a community, we must stamp out violence against Australian women, and bring an end to all forms of family and domestic violence, whoever the victim. Dr Gannon said that health care providers may see more results of violence in their patient contacts than law enforcement agencies. “Women experiencing domestic violence will share their experiences with GPs more often than with any other professional group,” Dr Gannon said. “The health impacts of family and domestic violence persist long after the violence ceases. “Women who have experienced this violence report higher levels of mental disorders, increased rates of physical disorders, impaired quality of life, and higher rates of suicide attempts. Dr Gannon said that education, awareness, interventions, and models of care that help both victims and perpetrators are desperately needed. “All doctors need access to training that exposes the extent of different forms of family and domestic violence, and the medical and psychiatric consequences for the victims – be they men, women, children, young, or old. “Special care is also needed for the perpetrators. “Responding effectively to family violence requires knowledge of the physical and emotional consequences of the violence, an understanding of appropriate and inappropriate responses, and having good networks with local family and domestic violence services. “Family and domestic violence is a national crisis that needs a national solution, with a local focus and local responses,” Dr Gannon said. In 2014, there were 95 victims of family and domestic violence-related homicide offences recorded by police. 40 per cent of women who have experienced violence reported that they received injuries as a result of family and domestic violence. Intimate partner violence is the leading contributor to the preventable death, disability, and illness burden in women aged 15-45. One in six Australian women have experienced physical or sexual violence from a current or former partner; while one in three women have experienced physical and/or sexual violence perpetrated by someone known to them. The Australian Bureau of Statistics’ Personal Safety Survey estimated that 5.3 per cent of men and 16.9 per cent of women have experienced physical or sexual violence perpetrated by a current or previous partner since the age of 15. The ABS survey estimated that 14 per cent of men and 25 per cent of women have experienced emotional abuse by a partner since the age of 15. An estimated 62 per cent of women and 8 per cent of men experienced their most recent incident of physical assault in their home. It is most common for women to experience violence from a male ex-partner. Perpetrators of family violence against adult males tend to be both male and female, whereas perpetrators of family violence against adult females are mostly male. 61 per cent of women who experienced domestic violence had children in their care when the violence occurred. 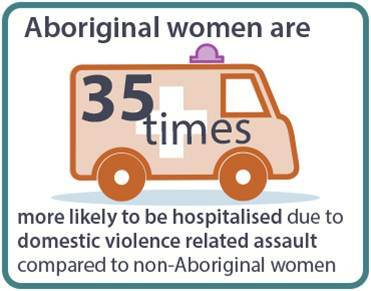 Aboriginal women are 34 times more likely to be hospitalised because of family violence than other women. 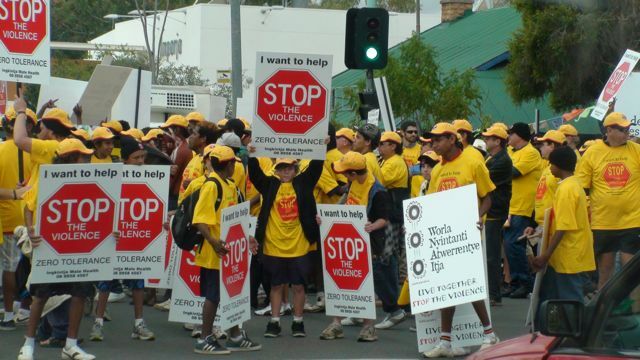 More than one million children in Australia are affected by family and domestic violence. “We know from our research that the role of alcohol in family violence cannot be ignored. Alcohol contributes to between 23 to 65% of domestic incidents reported to police and between 15 to 47% of child abuse cases reported in Australia. The foundation’s chief executive, Michael Thorn, said he expected New South Wales Bureau of Crime Statistics and Research to be released in a few weeks’ time to show a significant and immediate drop in family violence as a direct result of the state’s lockout and last-drinks laws and tightened bottle-shop closing hours. “There don’t seem to be any alcohol or mental health experts attending this domestic violence summit, even though we know from research their significant contribution to family violence,” Thorn said. This included reforming the way alcohol is taxed, restricting the sale of alcohol to reduce its availability, and tackling the sexualisation of alcohol through advertising, he said. Among the signatories to the statement were professor of social work at the University of Melbourne and domestic violence researcher, Cathy Humphreys, and the chief executive officer of the Central Australian Aboriginal Congress Aboriginal Corporation, Donna Ah Chee. The chief executive officer of Domestic Violence Victoria, Fiona McCormack, who was not a signatory to the statement, said she would be surprised if governments weren’t taking the role of alcohol in family violence seriously. “My experience of the federal government and in fact all governments is that they’re working from the current evidence,” McCormack said. But a signatory to the statement, Assoc Prof David Caldicott, an emergency consultant at Calvary hospital in Canberra,said governments were not taking the role of alcohol “an an agent in harm” seriously. “I completely understand the perspective of those who are concerned that focusing on alcohol takes away from the role of the responsibility of the perpetrator,” he said.